As can be seen from this diagram, I have added a number of tagged values (which are modelled as attributes in the UML profile) to cover off the typical data that needs to be captured in relation to a measure. Benefits Realisation Management is one of those classic programme / project disciplines that “everyone” agrees is a great idea, which in my experience is more overlooked than observed. The main sources in the literature I’m aware of are books by Bradley and Ward & Daniels. I’ve also had the privilege of learning directly from Gerald Bradley, so my own approach is very much influenced by his work. A key tool is the use of visual maps, both interactively with stakeholders to discover benefits, and then as a way of presenting and communicating the complex causal links between an IT investment and the benefits it allegedly supports. Interactive mapping works best with tactile materials – Post-It notes, sticky card etc. But for analysis and presentation some kind of tool is needed – drawing tools may work for smaller maps, but it very quickly becomes impractical, and something model-based is required. Specialised tools are available, but they are just that, specialised tools: a good investment perhaps, but nevertheless a substantial outlay. The lack of affordable tools might, I suggest, be a block to wider adoption of these methods. I’ve blogged before about using general purpose UML modelling tools to help programme shaping, so it was natural that I looked at extending this approach to benefits mapping. Objectives Why are we doing this? Business Changes Any change in the way a business operates, for example in terms of resourcing, behaviours, skills, processes etc. Using the language constructs in this way means that it is possible to use the traceability features within the tool to identify all the chains of dependencies. Later posts will cover the development of the UML Profile, including the addition of attributes to the benefits and the modelling of measures. I’m in the middle of a review cycle with a group of stakeholders who are used to talking about project benefits, but who perhaps have not used visual maps before – I shall blog how it goes! How can visual models improve the flow of work during programme shaping? This is the sixth post in a series about applying the lessons of lean (especially lean software development) to the shaping phase of programme management. In previous posts I have talked about amplifying learning, the application of the ideas of flow and a value stream to programme shaping, and touched on sources of “waste” in the typical programme environment. In this post I want to talk a bit about (visual) models. I’ve found two sorts of model useful when pulling together a programme – models of the shaping process itself, and models of the programme design. In previous posts I’ve talked about looking for flow in the programme shaping process. Every organisation, and to some extent every programme, will have a different flow for the shaping process. For most this will involve some number of iterations of capturing and designing information, creating programme artifacts, and seeking approval from various stakeholders. 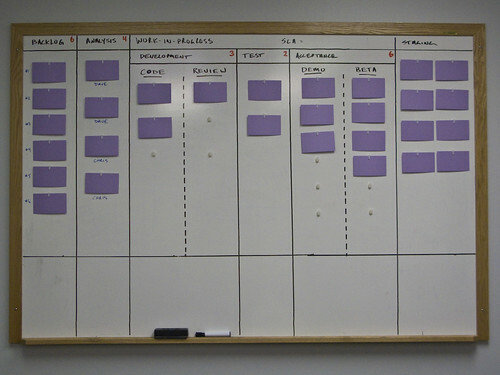 I have talked about keeping work-in-progress to a minimum, and the classic tool for managing that is a kanban board. The other area where models are vital is in describing how the programme will work and what it will deliver – in other words, the design of the programme itself. Programme documentation has always been a way of sharing a model of how things will work and what will be achieved, but I think there are lessons we can learn from other disciplines to make the documentation more useful. Many traditional programme documents are heavy on words and light on diagrams. Words are vital for providing detail, but they are not the best choice for communicating the relationships between concepts, nor for illustrating causal chains (for example from enabling projects to capabilities to benefits to outcomes). I’m suggesting that as programme managers we can usefully make more use of visual models to augment our programme documentation, and to model the relationships between different parts of the documentation. I’d like to hear from other programme managers about their experience with visual modelling.